Marianne found her first pet Scottie in 1992 and trained him for a CD title and therapy dog work. She started learning to groom and show in confirmation in 1998. In 2001, John and Marianne established FireHeart Scottish Terriers, and since then, have finished ten breeder-owner-handled champions, including multiple Specialty winners and All-Breed Group and Best-in-Show winners. John and Marianne were the recipients of the 2003, 2004 and 2005 Deblin Back Talk Award for a 3 year total of 13 owner-handled Specialty Best of Breed wins. Marianne has also earned titles on many of her champions in agility, obedience and earthdog. She has given several grooming seminars and was the Chairman of the newly redesigned 2010 STCA Guide to Grooming the Scottish Terrier. 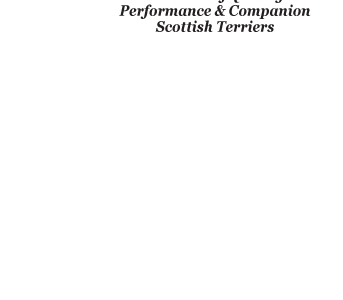 This new manual was awarded the 2011 Maxwell Medallion from the Dog Writers Association of America. She and her committee also were honored by the STCA for their efforts with the Anstaam Achievement Award in 2011.